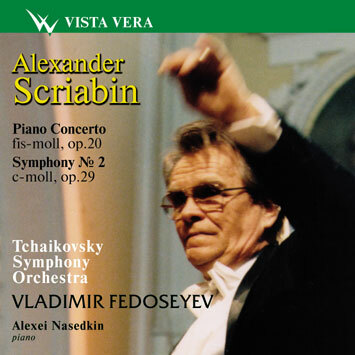 Skriabin's Piano concerto is the only one he wrote in this genre. (Let's note however that there is an example of entirely different synthesis of symphonic and piano music in his symphonic poem Prometheus with a thoroughly written part of piano.) The piano concerto was written in 1896 - 1897. It's Scriabin's first fully completed score. The composer was probably guided more by concertos by Chopin rather than Liszt or Tchaikovsky. The main theme of the Concerto reminds of the best pages of the Russian elegiac music of the late X1X century including Skriabin's preludes and…the main theme of the Rachmaninov's First piano concerto that was also written in F sharp minor. One could notice that in these two concertos two great Russian composers, Rachmaninov and Skriabin, come near to each other at a minimal distance. Whatever the significance of the part of piano in Concerto the orchestra "does not only plays the role of accompanying it. The drive towards dramatic development differs it from typically chamber concertos" (Victor Delson). The dramatic culmination of the first movement comes like a prototype of Skriabin's future orchestral apotheoses. Orchestra also plays an important role in the Finale that represents a most developed symphonic part of the concerto. Dramatic and lyrical elements coexist here in the main theme. A slow movement of the composition includes a theme with four variations. A meditative lyrical theme is typical for Skriabin's slow music of his early period. Melodic character of the theme and the development of variations remind of piano style by Anatolii Lyadov. One can see genre prototypes in some variations (the second sound like scherzo, the third reminds a funeral procession, a little bit like march from the First sonata, and the fourth variation comes like nocturne). Symphony No 1 in E major (1899 - 1900) became the first experience of a multipartite program-music composition. Although the program of the music is somewhat hidden here Scriabin combines a six-part cycle into a coherent musical poem with a choral finale. This gives us a clear vector of the road leading eventually towards The Poem of Ecstasy, Prometheus, and his late piano sonatas. A number of movements in the Scriabin's Symphony No 2 C minor (1901) is also somewhat uncommon. There are five of them. However the structure and dramatic composition of the cycle come out clearer and more consistent than in the First symphony. One can take the first two movements as an introduction and exposition, the third - a collateral one, the forth - an elaboration, the fifth - a reprise and coda of some kind of a one-part sonata-like cycle of a "higher-order mode" in music. To substantiate this interpretation one could mention that the first movement sort of grows into the second one, the forth movement into the fifth one. Besides, and this is even more important, the symphony brilliantly and consistently develops monothematic principle. Dramatic and lyrical themes of the whole composition grow out of the theme of the first slow movement.